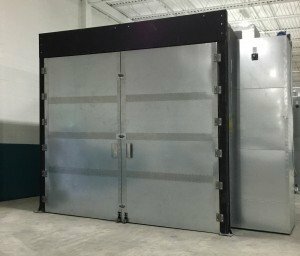 At Reliant Finishing Systems, we pride ourselves on providing some of the most energy efficient powder coating ovens in the world. Our ovens reach curing temperatures much faster than many of our competitors’ ovens and at a fraction of the operating cost. If you need a powder coating oven that can provide professional quality results on a daily basis, a U.S.-built oven from Reliant Finishing Systems will get the job done, and it all starts with the powder coating oven airflow. Reliant’s innovative design uses one or more powerful direct-fired burners to heat the oven through an overhead plenum. Hot air is injected from the plenum directly through the oven’s ceiling. Each heat unit continually pulls the coldest air from the bottom of the oven back through the burner to be reheated. At the same time, the exhaust is constantly pulling cold air from the floor and enabling hotter air to move into every corner of the oven’s interior. This combination of vertically positioned heat units and floor-mounted exhausts is unique—and just plain better. 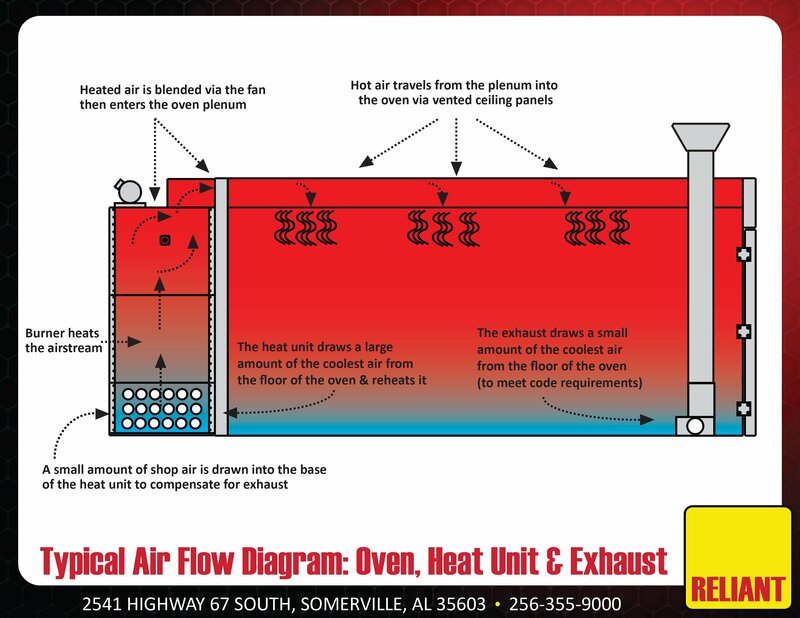 Typical airflow of a Reliant powder coating oven with a side-mount exhauster and rear-mounted burner and heating unit. By comparison, many other ovens on the market use both roof-mounted heaters and roof-mounted exhaust units. We don’t use this design because it makes routine maintenance tasks and inspection much more difficult – the operator has to climb on top of the unit every time anything needs to be checked. Also, top-mounted heat units and exhaust units remove the hottest air from the oven instead of the coldest. Why would our competitors build ovens this way? The answer is that this design is much cheaper to build. With a Reliant powder coating oven, since we’re taking the coldest air from the bottom of the oven in a constant cycle, the oven air is much more evenly heated throughout the cabin. This has two major benefits. First, the oven quickly reaches a very stable temperature. Second, that constant temperature means you won’t have to deal with hot and cold spots in your oven. By eliminating temperature inconsistencies, the powder can cure evenly and uniformly without the potential for flaking, undercuring, or overbaking. That means a better and longer-lasting finish. But what does that mean for you? Because our ovens get to temperature quickly and sustain that temperature evenly, they require far less fuel to operate. Typically, our customers using standard models can get their ovens to 400 degrees or more within 10-15 minutes, and maintain that temperature for an entire production day with minimal energy costs. For one of our most popular models, an 8’ x 8’ x 20’ walk-in oven, heating costs are often as low as $3 per hour on average. Reliant’s superior airflow design is just one of the reasons why we’re so proud of our powder coating ovens. A Reliant powder coating oven is built to give you reliability, fuel economy and top-notch performance at an unbeatable price. Don’t just take our word for it, ask for references so you can talk with our customers about the incredible results they are getting every day with Reliant equipment. Click here for more information on our powder coating ovens and related powder coating equipment, or give us a call today. This entry was posted in News on February 22, 2016 by Reliant News. Get the latest info on Reliant powder coating equipment, training, installation and more.